Description: This recent addition to the Trafalgar lineup is brewed using a combination of pale malt and fresh hops harvested from from the local Van De Slyke Farms, located in Statfordville, ON. 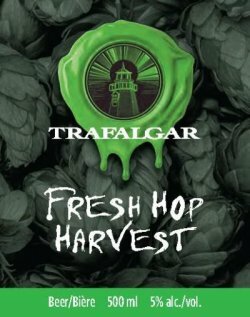 This is the second fresh-hopped beer in their lineup, and carries on in the tradition of Trafalgar being the first modern brewery to locally source fresh hops for use in their beers. Tasting Notes: Here is a brewery which I have sorely missed since moving to BC, especially their Celtic Ale. And while I could not find this beer while in Ottawa, I did stumble across their Fresh Hop Harvest and knew I had to try it. And while it is certainly on the powerfully bitter side, I can’t deny the quality and craft of it. A smooth and semi-sweet malt base combines with strong notes of grapefruit, citrus and floral hops, augmented by a yeast culture that is somewhat reminiscent of a saison. Basically, a sharp and bitter punch to the tastebuds. Glad I got it! Description: This lager, which is Hop City’s flagship beer, is brewed using a combination of of Pale Two-Row, Crystal, Dark Crystal , Munich, and Torrified Wheat malts, which are then bittered with Hallertau Mittelfrueh and Saaz hops. 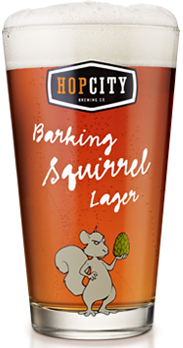 Tasting Notes: This is the second time I’ve sampled Barking Squirrel, the first time being during my 2013 trip to Ottawa. Somehow, my review card was full and I neglected to give it a proper write-up, which I am corrected now! This is very much a good, clean-drinking lager, with some maltier notes that are reminiscent of a good Marzen. A crisp and slightly sweet malt base with notes of sweet bread and caramel combine with a dry, noble hop flavor to create a very quaffable and drinkable lager. Description: This beer takes it name from the fact that it is a departure from the regular North American style India Pale Ale. In addition to being dry-hopped, it is also sessionable, creating a lighter, more accessible IPA that is easy drinking. Tasting Notes: This was one of my first sampling from 2015 trip to Ottawa. 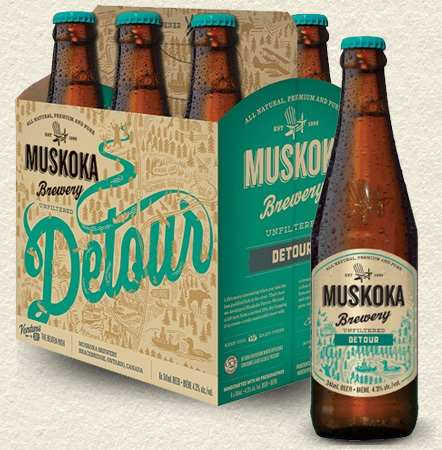 Muskoka is an old favorite when it comes to craft brewing, and it seems they have been getting better and more experimental in my absence. This was a neat take on a traditional IPA, and not just because its subtler and lighter. It also has some very interesting flavor notes – which include orchard fruits you don’t normal expect in an IPA. And that accompanies the usual citrus and grassy hops. Quite an interesting take. Description: A seasonal release, and part of their series of character-based releases, this Imperial Pumpkin Ale is brewed using using a hefty dose of pale malt, then infused with spices, pumpkin flesh, and aged in bourbon barrels. Tasting Notes: You might say this beer is Central City’s regular pumpkin ale on steroids (or some other performance-enhancing drug!) The malts are heavy, the pumpkin flavor intense, and the alcoholic bite noticeable, Unfortunately, this kind of subdues the spice palate and the bourbon flavor. Still, a lovely and powerful Autumn brew. Description: This seasonal release is available only for the Fall pumpkin season. It is brewed single-batch-style, using pale malts, real pumpkin, and then infused with whole spices (what I strongly suspect are cinnamon, nutmeg and allspice) and aged with oak. Tasting Notes: Compared to my previous samplings of Happy Jack, this one was stronger on the spice palate. These work well alongside the smooth and slightly sweet malt base, which of course benefits from the infusion of pumpkin. So I actually found myself enjoying it more than last year’s offering. Hence I am upgrading it from last years 8.5 to a solid 9. Kudos to the brewers! Description: This latest release from Category 12 is the brewery’s shot at what is currently one of the most popular styles of West Coast ale. It is fashioned using plenty of (what I can only assume are) pale and Crystal malts, then generously hopped with Mt. Hood, Cascade & Centennial hops for an intense flavor – like a good IIPA! Tasting Notes: Let me just say I’m very proud of C12 and the work they’ve been doing of late. This brew is just one of a few new concoctions they have come up, and intend to review them all. In any case, this beer was a faithful example of a West Coast Imperial IPA, employing a strong, slightly sweet and coarse malt base and an intense hop flavor that has notes of citrus, pine, passion fruit and dried herbs. And yet, despite it power, it manages to finish quite nicely and cleanly. Not what you’d generally expect from a Imperial IPA.